You’ve been chugging along as a rhythm guitarist and may have gotten proficient at it. Now you are starting to get the itch to start soloing. At the same time, you may be worried that you aren’t up to doing it successfully. Here’s good news: although it takes time to learn the basics of lead guitar, it is not impossible. Guitarists make the transition every day. Another thing to consider: Being able to transition from rhythm to lead and back again will increase your versatility (and marketability, if you wish to look at it that way). The following instructions are but one way to accomplish your goal; consider them suggestions to get you started. If you try these and are encouraged to continue, there are many other resources that will keep you going. You can even start with your guitar instructor for some professional guidance! Take any chord, and rather than playing all the notes at once, play them one at a time. Play them over and over again until you have memorized the notes. Go up and down the scales, and gradually memorize the notes that make up each chord. 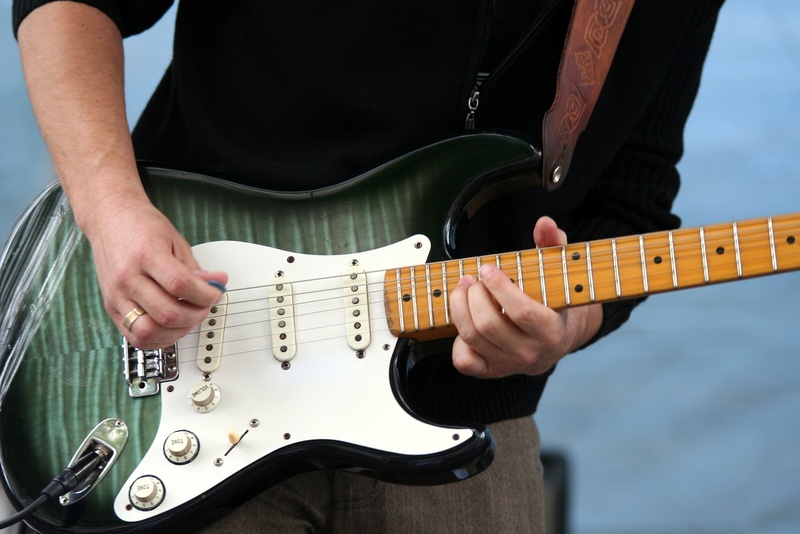 You may start skipping around within the chords and find some fun, repeatable licks. It is very helpful to record yourself doing this, as you may find a certain sound that you want to repeat or augment later. Blues scales are the basis of many guitar solos, particularly rock, jazz, some country, and (of course) blues. Learn to perfect these scales and pick out the notes individually, just as you did chords. Once you have mastered this, you can move to more advanced scales such as pentatonic scales. These five-note progressions interlock on the fretboard to map out the various musical modes, like “Aeolian” (minor) and “Ionian” (major). There are many other types of scales as well, but these are the most frequently used for most Western music, and certainly for rock. Once you have mastered these, then you can move further. At this stage, it’s a good idea to draw out a fretboard diagram. Study the way all the notes fit together, and make sure you know what notes are represented where. This is an invaluable tool for you as you progress in your soloing. As you continue to improve your memorization of notation and picking, you can now try numerous commonly-used techniques to expand your sound. This includes hammer-ons (sharply bringing a fretting-hand finger down on the fingerboard behind a fret, causing a note to sound) and pull-offs (plucking a string by “pulling” the string off the fingerboard with one of the fingers being used to fret the note). This is also a good time to learn to bend the strings to make the notes go up as you like. (Don’t go too crazy with bending to begin with, though. You risk string breakage.) Again, as you play around and become more familiar with the techniques, record yourself for posterity. This is one of the most effective ways to learn soloing technique. Tablature substitutes regular notation with a fretboard diagram indicating where to fret each string to get the note you are looking for. Many music books are available with tablature. Magazines such as GUITAR WORLD and GUITAR PLAYER have tablature for popular songs in the back of their issues. Analyzing, playing, and breaking down the notes will make you a more versatile soloist. Make no mistake – learning to be a good lead guitarist takes a lot of time and patience. But if you follow these suggestions, you can be on your way to shredding with the best of them.